Is Agility a Good Activity for Your Dog? 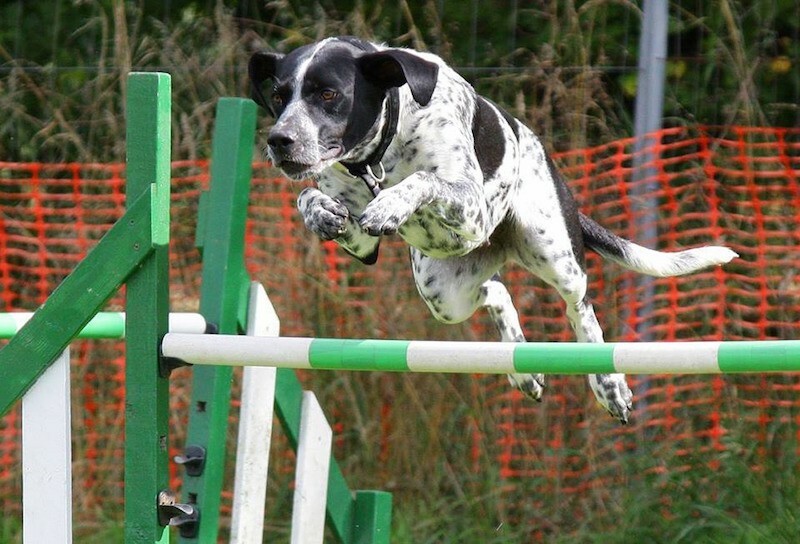 All agility organizations use some type of jumps in canine agility. Dog agility is a sport in which a handler is given a set amount of time in which to direct a dog off-leash through an obstacle course. Originally loosely modeled on equestrian stadium jumpers competitions, the sport has evolved its own additional obstacles, scoring systems and performance ideals. Agility made its debut as an entertainment for spectators at the Crufts Dog Show in 1979; it has since become the most rapidly growing dog sport in England, Western Europe and North America. Spectators continue today to get caught up watching the dog and handler’s enthusiasm in their athletic race against the clock. In the United States, there are several national organizations for agility which sanction tests or trials held by local dog training clubs. Trials which are based on the original international rules and specifications call for the highest level of agility from the dogs both in terms of speed and the physical ability to perform the obstacles. There are also domestic varieties of the sport that call for less actual agility (by using lower jump heights and smaller obstacles) from the dog and focus more on the handling aspects of the game. The obstacles used in agility have been designed with both safety and spectator appeal in mind. All jumps have easily displaceable bars so that the dog should not experience injury should he misjudge and take down a jump bar. All obstacles that the dog must physically scale have ‘contact’ zones painted on the equipment; the contact zones enforce safe training techniques since handlers know that dogs will be faulted unless one or more feet are in the contact zones when ascending/descending these contact obstacles. All contact equipment surfaces are roughened for good traction in both dry and wet weather. In competition, the obstacles are arranged in various course configurations, always unique from trial to trial, that offer levels of challenges appropriate to the class and experience level of the dogs competing. The handler must direct their dog around the course in the sequence that has been predetermined by the judge. At the entry levels of competitions, courses contain few complications and are more of a test to prove the dog can competently perform the equipment within a reasonable amount of time. As the dog and handler earn their way into successively higher levels, the courses increase in complexity and begin to require split second timing and coordination between the handler and dog in order to accomplish the course within the ‘Standard Course Time’ (SCT) established by the judge. The rules are fairly simple; handlers may give an unlimited number of commands or signals to their dogs, but may not touch either the equipment or the dog. Dogs are ‘faulted’ for actions such as taking down a jump bar, failing to put one or more feet in the safety or contact zone when ascending/descending contact equipment, taking obstacles out of sequence, and running past or stopping before the next obstacle to be performed. Time penalties are additionally assessed against dogs that exceed the SCT. Agility trials are open to all dogs, both purebred and mixed breed. Dogs of medium build that come from breeds and/or lines of breeding that have retained their original working abilities tend to be the most successful in agility competitions. However, not only does no one breed dominate agility trials, outstanding individuals of nearly every breed are seen performing well both in local and national events. Because of the athletic requirements of the sport, dogs that are less agile by nature of conforming to the physical structure typical for their breed are only rarely seen or successful in the forms of the sport conforming to international rules (USDAA and AAC). These dogs can be successful, however, at the domestic forms requiring less actual physical agility (AKC, UKC and NADAC). This applies primarily to the larger, giant breeds and to some extent the short-legged, long backed breeds. Dogs must be at least 6 (UKC) or 12 (AKC) months of age to participate in trials held under domestic rule variations and at least eighteen months of age to compete in trials held under international rules (USDAA, AAC, and NADAC). Serious jumping and weaving work should be put off entirely until the puppy is much older. Because of the long term negative impact of jumping and flexing on immature, growing bones, owners are advised to research their breed thoroughly and only begin intensive agility training of this type when the dog is past the age at which the ‘growth plates’ are known to typically close for that breed. A very imprecise guideline for growth plate closure in mixed breed dogs would be 9 – 12 months for dogs under 50 pounds and 10-14 months for dogs over 50 pounds. Most dogs are able to participate and do well in agility until they reach 8-10 years of age. Owners should then gradually scale back their training and competing to obstacle heights and classes more appropriate to their ‘veterans’ if they wish to continue at that point. Some basic obedience training is necessary before commencing agility training. At a minimum, the dog must be able to sit, down, promptly come when called off-leash, hold a brief stay, maintain control around other dogs, and accept handling by strangers. Off-leash heelwork is a big plus but not required. In addition, a trainer/handler that has encouraged their dog from puppyhood to play fetch will have a distinct training advantage over someone who has not. Initial agility work begins by introducing the dogs to low and/or smaller versions of the obstacles. The height and/or length of the equipment is slowly extended over several training sessions to their full competition forms. Dogs at this stage of training require physical ‘spotting’ similar to gymnastics training while they develop the necessary skill and confidence on the obstacles. Leashes are usually quickly dispensed with as they may become entangled on the dog and/or equipment. Techniques or collars that apply physical corrections of any type should not be used; they are disruptive to maintaining balance & physical coordination (and may therefore lead to injury) and will slow down the dog’s opportunity to become physically and mentally confident in his ability to negotiate the equipment safely. Physical handling and spotting techniques are often supplemented with food, praise, and fetch/tug type objects that both lure and reward the dog to perform the equipment. Once the basic obstacle work is learned, the dog enters the next phase of training. During this time, the handler works to gradually condition the dog to higher jumps and obstacle heights, and to develop a working ‘command vocabulary’ of both verbal and body signals necessary to direct the dog off-leash around an agility course. A well-trained agility dog learns to respond instantly to commands directing him to perform specific obstacles (when obstacles are placed immediately adjacent to one another) as well as commands causing him to run faster/slower, turn left/right and veer away from/closer to his handler. At the highest levels of agility competition, it is possible to see dogs that are able to perform these commands and maneuvers instantly and accurately even when working at full speed several yards away from their (much slower) handlers. Veterinarians should be informed what is planned for the dog and the dog should be radiographed for both hip & elbow dysplasia. The owner should reconsider their plans for agility if the dog is rated anything less than ‘Fair’. Unobstructed vision is also critical. Because agility is a fairly new type of dog competition, it is not unusual for a veterinarian to be unaware of the requirements for agility. In this case, it is very helpful for the owner to have available a short video (2-3 minutes long) of a dog performing the equipment; this will give the veterinarian an idea of the physical requirements necessary for the sport. Both the owner and veterinarian should be particularly sensitive to the dog’s weight. What is a good healthy weight for a pet dog with normal activity expectations may be too heavy for agility training and competition. Poor performance or injuries, which can include muscle strains and other soft tissue injuries, are nearly always due to the ‘weekend athlete syndrome’ — i.e. the dog is overweight and/or not conditioned properly. On-going conditioning separate from the equipment training is vital to keeping the dog’s agility performance high and injury-free. Weight bearing exercise is the most appropriate; for example walks interspersed with short sprints condition both the dog and the handler. Long distance, low to the ground games of ball and/or frisbee are particularly helpful for building the dog’s cardiovascular and/or muscular capacity. Swimming can also be beneficial for improving cardiovascular & muscular capacity. Some ongoing physical maintenance of the dog is necessary as well in order to prevent injury whether in training or competition. In particular, nails must be kept trimmed back at all times so that they do not catch on the equipment or impede the dog’s traction. Some sacrifice in dog appearance must be accepted in those breeds which have a lot of hair over or about the eyes; this hair must be kept trimmed or tied back so as not to interfere with the dog’s vision.